A new feature is being introduced this week to our Weekly Update. We try very hard to minimize the emails we send to you each week. We save things up to include in this weekly Monday morning update. When you get an "eBlast" any other time of the week, you know it is something pretty important and usually is a call to action! From time to time we get notifications on grants and other RFPs. We know that some of our members are very interested in these announcements and so we want to be sure they get as timely an access to this information as possible. We will be putting this information behind our members only section on our website, we will post it on our Facebook page and we will be including it in this weekly update in a special section. (See below — insert the location or link to the grant information) Do you have other ideas of what CASE should be doing to better meet your needs? Let us hear from you! Speaking of timely information ... Do you know if your state will be represented at the CASE Educational Legislative Leadership Summit, July 13-16? You can make sure by signing up to attend. This a great opportunity for you to reconnect and be revitalized with your colleagues from your state and with those from other states! We will begin on Sunday July 13 with registration at 4:00-4:55 and the session will begin at 5:00. We will be done by 7:00 p.m., just in time for you to grab some colleagues for a nice evening meal in Old Town, Alexandria! We need every state to have a team attending the 12th Annual CASE Educational Legislative Leadership Summit, July 13-16, 2014. Go to the CASE website to register and click here for the flyer. This year as every year, it is very important for CASE to have as many different states represented up on the Hill for our visit on Tuesday, July 15. There are several really important national issues we will be working on in DC this year with our other association partners. Don't miss this great opportunity. And, with a hotel group rate of $149 at the Hilton Old Town, right across from the King Street Metro stop, this might be a great time to do a DC excursion for you and the family! The Group rate ended on June 17 but there may still be rooms available at the higher rate click here to make your hotel reservations! Click here to download a flyer. The In CASE Newsletter was sent out last week. If you are a current member of CASE, and you have a current email on file with CEC, and you haven't asked to be on the no email list, then you should have received an email with the link to the newsletter on Monday, June 16. Members can always access the In CASE Newsletter in the Members Only section of the CASE website. 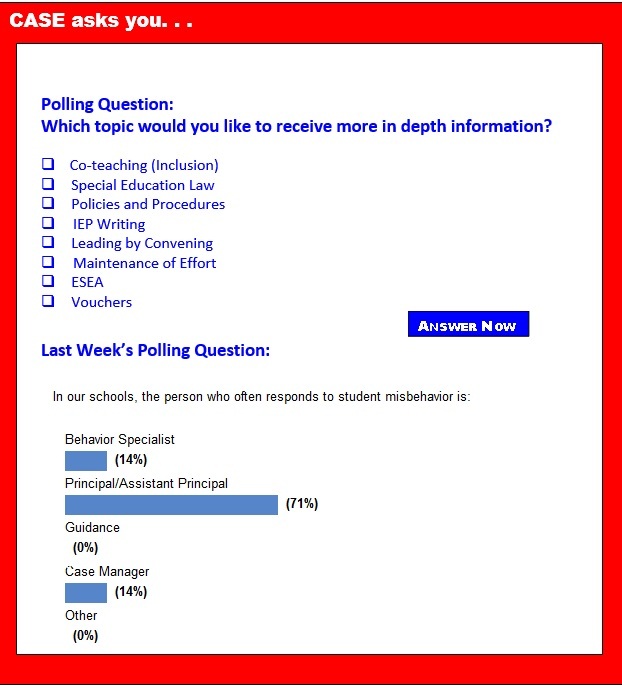 PS ... Last week's poll indicated 71 percent of all discipline is handled by the Assistant Principal. Have you considered telling them about CEC/CASE? The new tiered membership that will be launched on July 1 will make membership in CEC very affordable. The wonderful resources CEC/CASE and the other divisions could be a great benefit to principals and assistant principal! Click here to read more about the new tiered membership! CEC past president, Dr. Christy Chambers, sent us a link to SpED Talks — a set of short videos she narrated though a team effort with Don Johnston. They cover hot topics in special education. The first one addresses changing curriculum standards (including the Common Core) and how they affect students on the alternate assessment. It peeks into a school that is addressing the new standards. Many parents often wonder what will happen after their child graduates high school. How will your child get the help he deserves in college? What schools can provide the supports your child needs? The White House Initiative on Educational Excellence for Hispanics is hosting a webinar on Hispanic families and special education. This is part of a monthly webinar series, designed to share information and foster peer networking around key education topics of interest to the Hispanic community. Many parents often wonder what will happen after their child graduates high school. How will your child get the help he deserves in college? What schools can provide the supports your child needs? Maybe you want your child to attend a four-year university or maybe a community college or trade school. But here's the problem — if your child has a learning disability, or any disability for that matter, there's no easy way to get information on options after high school. As educational leaders, we spend considerable time building plans for a variety of stakeholders. After that first, often arduous writing of the initial draft, many leaders struggle with how to revise the plan in meaningful, engaging ways. Chuck Bell, a second-year superintendent in Elbert County, Georgia, created his system's first-ever improvement plan then ran his summer leadership retreat and was stumped with what to do next. He chose to model a process that school leaders could immediately lift and use in their schools. Small study of one class of 30 pupils suggests phonics can be a real boost to reading. Children taught to read using phonics are 2 years ahead of those who learn by the 'look and say' whole language approach, according to a small new study. Phonics techniques — blending common sounds into words — have been widely used in schools in England since 2010. The research followed a single class of 30 children who used the phonics method from reception until the end of year 2 in primary school, between 2010 and 2013. Video surveillance, school safety officers, concrete barriers and metal detectors are just the tip of the iceberg when it comes to preventing shootings in schools. School safety experts suggest the best strategies for preventing school shooting complement those approaches, which they refer to as "target hardening," or making targets more difficult to attack. People like Beverly Kingston, director of the Center for the Study and Prevention of Violence Institute at the University of Colorado Boulder, suggest that halting school violence starts much earlier. Historically, state departments of education, or SEAs, have — for the most part — been compliance-focused organizations that managed federal education policy. Over the past several decades, these agencies have been education policy implementation entities. Today, while their compliance responsibilities have remained, they are taking on more responsibility for education and academic outcomes than ever before, substantially increasing the scope of their work. State leaders and their staffs must distribute federal education dollars and monitor the districts' use of these funds in accordance to regulations set by federal policymakers. Stephen Colbert mocked it. Comedian Louis C.K. called it a "massive stress ball that hangs over the whole school." And lawmakers in state capitols spent countless hours over the past few months debating it. Their target is the Common Core, a set of math and English language arts standards voluntarily adopted beginning four years ago by all but a handful of states. The standards define what students should know and be able to do by the end of each grade. A new study tries to determine whether there might be a correlation between how a room is decorated and kindergartners' learning. The researchers wanted to know if too many decorations could actually be distracting or overstimulating for young minds. But similar questions could be asked about how classroom environment might influence older students' academic performance as well. Does the way your classroom is decorated affect your learning? Teenage bullies and their victims are more likely to carry weapons than kids not involved in these abusive relationships, according to a new research review. With school shootings a concern across the United States, the findings — culled from 45 previously published studies — put a spotlight on the potential link between bullying and subsequent violence, experts said. As school districts move toward a digital transition and attempt to create content repositories, ensuring that the digital content is accessible for students of all abilities is especially important. A new policy brief from the State Education Technology Directors Association, "The Accessibility of Learning Content for All Students, Including Students with Disabilities," notes that "digital learning materials ... can improve the classroom experience for all students, and they may hold particular promise for students with disabilities."